If you need to solve an equation of form Ax² + Bx + C = 0, this quadratic formula calculator is here to help you. With just a few clicks you will be able to solve even the most difficult problem. This article describes in detail what is the quadratic formula and what do the symbols A, B and C stand for. It also explains how to solve quadratic equations which have a negative determinant and no real roots. If you are able to bring your equation to this form, it means that it can be solved with the quadratic formula. The solution of this equation is also called a root of an equation. The quadratic equation has two unique roots when Δ > 0. Then, the first solution of the quadratic formula is x₁ = (-B + √Δ)/2A and the second is x₂ = (-B - √Δ)/2A. The quadratic equation has only one root when Δ = 0. The solution is equal to x = -B/2A. It is sometimes called a repeated or double root. The quadratic equation has no real solutions for Δ < 0. You can also graph the function y = Ax² + Bx + C. It's shape is a parabola, and the roots of the quadratic equation are the x-intercepts of this function. A, B and C are the coefficients of the quadratic equation. They are all real numbers not dependent on x. If A = 0, then the equation is not quadratic, but linear. If B² < 4AC, then the determinant Δ will be negative. It means that such an equation has no real roots. Write down your equation. Let's assume it is 4x² + 3x - 7 = -4 - x.
Δ = B² - 4AC = 4² - 4*4*(-3) = 16 + 48 = 64. Decide whether the determinant is greater, equal or lower than 0. In our case, the determinant is greater than 0, what means that there are two unique roots of this equation. Calculate the two roots using the quadratic formula. The roots of your equation are x₁ = 0.5 and x₂ = -1.5. 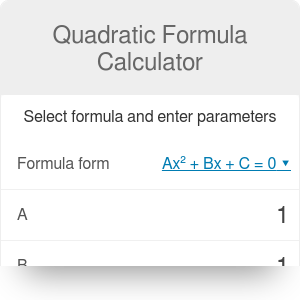 You can also simply type the values of A, B and C into our quadratic equation calculator and let it perform all calculations for you. Make sure you have written down the correct number of digits using our significant figures calculator. Even though the quadratic formula calculator indicates when the equation has no real roots, it is possible to find the solution of a quadratic equation with a negative determinant. These roots will be complex numbers. Complex numbers have a real and imaginary part. The imaginary part is always equal to the number i = √(-1) multiplied by a real number. The quadratic formula remains the same in this case. Quadratic Formula Calculator can be embedded on your website to enrich the content you wrote and make it easier for your visitors to understand your message.